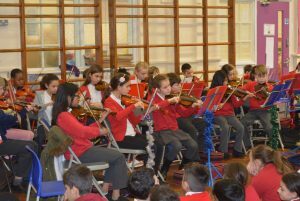 The children in Year 4 gave three concerts last week on Thursday 22 March. 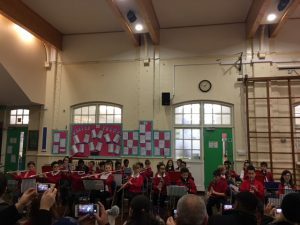 These were their last concerts playing flute/clarinet/saxophone. We were really proud of the progress they have made in the two terms they have been learning. We hope that lots of them will continue with lessons next term. 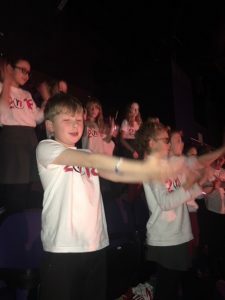 The Year 2 Choir took part in the Partnership Schools’ Music Festival last week on Monday 19 March. It was a fun morning singing along with children from Bowes New Southgate, Bowes Southgate Green, Tottenhall and Wilbury Schools. 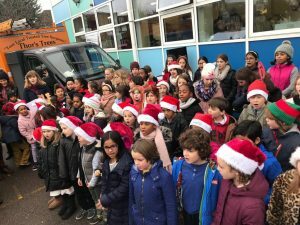 The children sang beautifully and we all really enjoyed the outing. Well done! 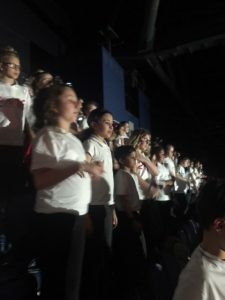 The Junior Choir took part in the annual Young Voices Concert at the 02 Arena on Tuesday 6 February. 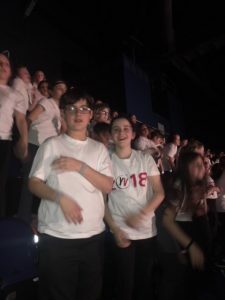 It was a busy day, rehearsing all afternoon and performing in the evening along with nearly 8000 other school children. Our children were really enthusiastic and sang brilliantly. As always, we were really proud of them! We had a fabulous Christmas concert on Tuesday evening 12th December. There were 134 children from the Junior School involved. 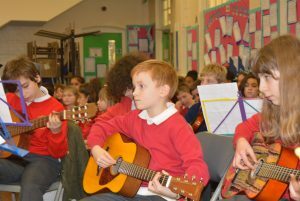 There were performances from the Choir, Wind Band, String Group and Guitar Group. Haze Samba also played and were joined by past pupils of Hazelwood. We also had some great songs sung by the Staff Choir and some Year 6 solos and small group pieces of a really high standard. What a great evening! 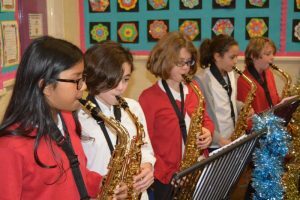 The children in Year 4 all performed on their flutes, clarinets and saxophones in three great concerts on Monday 4 December. They demonstrated the progress they had made on their instruments since they started learning them in September. We look forward to their next concert in March 2018. The children from both the Year 2 and the Junior Choir sang at the Hazelwood Christmas Bazaar on Sunday 3 December. We had a good turn out and they sounded really strong. Another fun and festive occasion. Well done everyone! 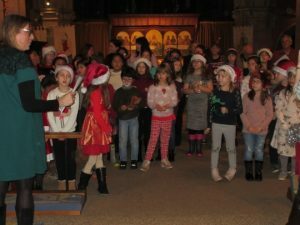 Children in the Year 2 and Junior Choirs sang Christmas Carols at St John’s Church during their Christmas Market. 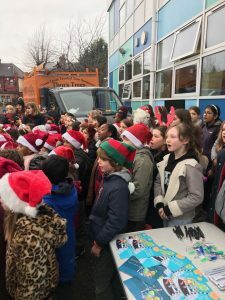 It was a very festive occasion and a good opportunity for our children to sing with members of the St John’s Church Senior Choir. Well done to everyone! 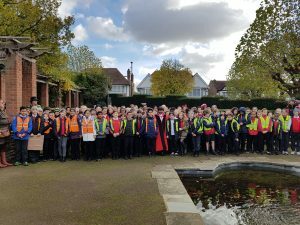 All the children in Year 6 went to Broomfield Park for the annual Armistice Service. They sang a medley of songs from the World War 1 period. They sang and behaved beautifully and were a real credit to the school. Their singing was an uplifting finish to a serious occasion. Well done! We had a busy time in the Summer term 2017. 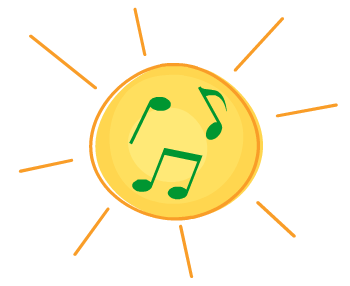 The Choir and Haze Samba performed at the school Summer Fete in June. 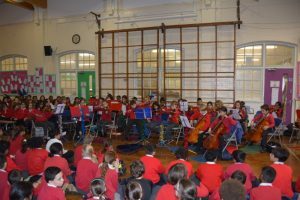 We also had the Year 2 Production – ‘Hazelwood’s Island Adventure’ – in June, featuring our Year 2 violinists playing in the overture. At the beginning of July the String Group, Wind Band and Haze Samba performed at St John’s Church Fete. They all played brilliantly and it was a lovely occasion. Well done! 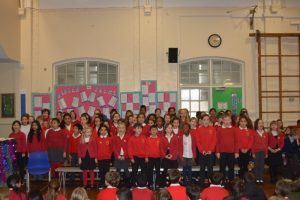 We took the Choir to sing at the Partnership Schools’ Music Festival at Highfield School where they joined with children from Highfield and Wilbury. It was a fun morning and our children sang and behaved beautifully! The highlight at the end of term was the Year 6 production of ‘A Tale As Old As Time’. The whole year group took part and the show was a huge success. 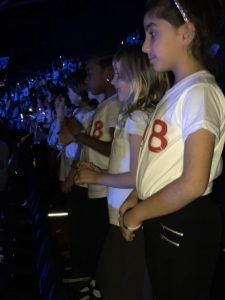 We took the children from the Choir – years 4-6 – to sing at the Young Voices concert at the 02 Arena on Tuesday 7 February. They had been working really hard on all the songs and performed confidently throughout the rehearsal and evening concert. We were, as always, so proud of their behaviour and enthusiasm. Well done – and many thanks to all the adults who helped with the trip. A huge congratulations to Ms Halpern and all of the musicians and singers for an amazing musical extravaganza. 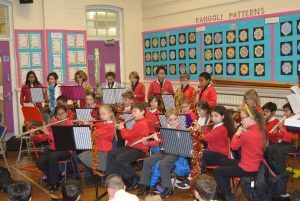 We had over 120 children perform in the Christmas concert this week. 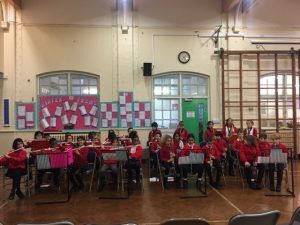 The school was filled with the beautiful sound of the Hazelwood Choir, Haze Samba, the String and Wind groups and of course our very brave and super talented soloists and of course the very talented Y6 Girl Group. The orchestra and choir had the audience spell bound for an hour and a half. 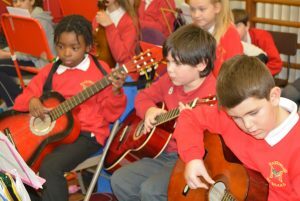 It showcased the wonderful talent and provision we have at Hazelwood and the importance of music and singing within our school. Congratulations to all involved. 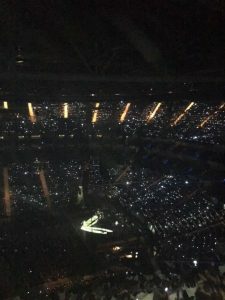 Check out some of the photos and videos of the performance below. The Choir sang at the Christmas Bazaar on Sunday 4 December. 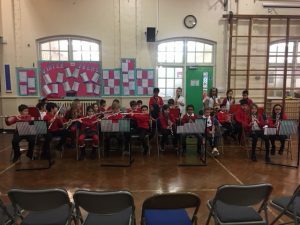 There were performances from the Wind Band, String Group, Haze Samba, Choir and lots of Y6 solos and small groups. 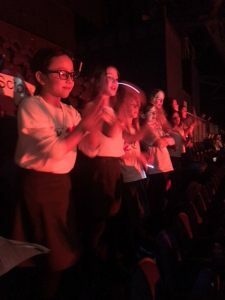 The children in the Choir (Y4, 5 and 6) took part in a very special event at the Royal Albert Hall. They all had a great time rehearsing and performing in the fundraising concert for Barnardo’s. 68 children from the Choir took part. They sang well and as always, made us very proud. Well done to all the children, but a very special well done to Sky Anderson-Daye from 5R who performed a solo verse. Thank you to all the adults who helped. Children from the Choir sang last Saturday 19 November at the switching on of the Palmers Green Christmas lights. It was a great turn out and the children sang really well. Well done to everyone who came!